This is my story of finding one of my life's questions and receiving an answer. Be patient toward all that is unsolved in your heart? Try to love the questions themselves like locked rooms and like books that are written in a very foreign tongue. Do not now seek the answers which cannot be given you because you would not be able to live them. The point is, live everything. Live the questions now. Perhaps you will then gradually, without noticing it, live along some distant day into the answer. I had already taken a couple of trips with Global Volunteers, the Minnesota-based organization that sends teams of volunteers to villages around the world as "servant learners." I already knew that philosophy fit perfectly, because I love connections with people. I look for the chances to get to know people on a personal level - to eat with them, pray with them, work with them, sing with them and party with them. 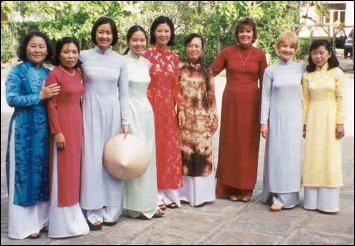 But when I heard that Global Volunteers was establishing a service program in rural Vietnam, I was immediately smitten. I wanted to go. Vietnam is the country I felt the most connections with, but I wanted to experience the culture and get to know the people in a personal way. In 1974, we received our youngest daughter, Karyn, from DaNang, Vietnam. The war was still going on, but we had worked for two years to get her. My husband and I are fond of saying that, of our four adopted children, our pregnancy with Karyn was the most difficult - two years!) Then, when the war ended and we heard the plight of those left behind, people who had helped us, I felt a connection, a responsibility. So, my husband and I headed a sponsorship group through our church that eventually brought four groups to St. Paul - two Vietnamese and two Hmong. I knew I was grateful to this country of my daughter's origin, but I also had questions. I wasn't sure what the question was until I got there. One evening, returning from teaching English to young adults with another volunteer, Quyen and I were honored when a student invited us to attend his friend's wedding. The event began at 5:30 a.m. when Quyen and I were picked up by two young women on motorbikes. Since I was the only Caucasian at the reception and a tall older woman besides (57), I attracted some attention. But Vietnamese people are, above all, gracious, so I felt very welcomed at this party. I was especially pleased when a Vietnamese man of about my age came over to speak with me. He said he'd worked for the Ministry in 1975 and had learned English. We talked and laughed and he brought his wife to meet me. He even invited me to his home. Finally I felt comfortable enough to ask him the question I discovered I'd been living, the question I'd asked several new friends once we'd established trust: "Are you angry at us Americans because of the war? Do you hate us?" This gentleman took my hand in the traditional Vietnamese clasp - both hands holding my hand - looked squarely into my eyes and said, "I am your brother, you are my sister. Those old times are history." That afternoon in Cao Lanh, partying at a rural wedding reception, both the question I needed to discover and the answer came to me. Mary Ann Novotny is a St. Paul Public School teacher and mother of an adopted vietnamese daughter. She traveled to Cao Lanh, Vietnam, as part of a Global Volunteers team to teach conversational English to children, teenagers, and adults.